*Do you need power cables? The new ATEM 2 M/E Production Studio 4K lets you produce broadcast quality live multi camera production in SD, HD or amazing Ultra HD. 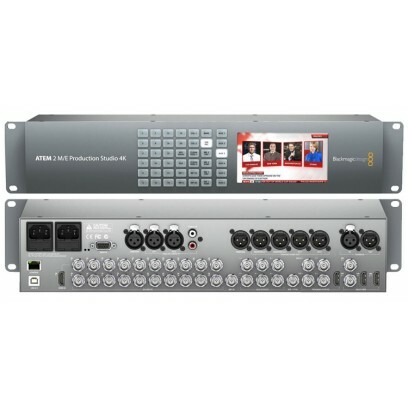 Featuring 20 inputs with built in re-synchronizers so you can connect the widest range of video sources such as cameras, disk recorders and computers for incredible live music, sport and more! ATEM 2 M/E Production Studio 4K has advanced broadcast features such as chroma key, customizable transitions, upstream and downstream keyers, DVE, Super Source, audio mixer, 2 x multi views, media pool and more! You also get 6G-SDI and HDMI 4K connections and 6 auxiliary outputs for the most advanced live production switching.